Work is busy and time is at a premium, but here are a few random mid-October NFL thoughts I've had on my mind recently. 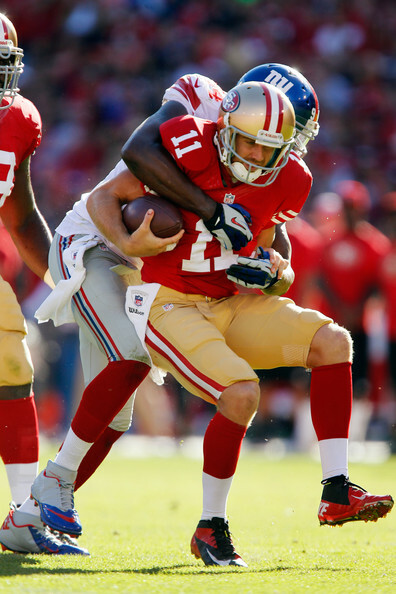 Did the Giants really discover the “blueprint” to beat the 49ers? After the Giants resounding 26-3 victory over the 49ers in Week 6, many people started asking whether Tom Coughlin and the rest of his coaching staff had crafted the “blueprint” for beating a San Francisco team that looked as formidable as anyone through the first few weeks of the 2012 season. During their impressive win, there’s no doubt that the Giants did things to the 49ers that many teams would like to do; they ran the ball effectively, forced Alex Smith to lead San Francisco from behind, and they prevented a fearsome 49ers front seven from wreaking havoc. But the thing that always gets me about these so-called “blueprints” is that any coach not named Norv Turner already knows how you want to attack the opposing team, it’s a matter of executing such a plan. Clearly, you’d like to get out to a nice lead against a team like the 49ers and force Alex Smith to have to pass them back into the game, while Frank Gore gets all of eight carries. Clearly, you’d like to get your ground game rolling against the 49ers usually stout front seven so your defense can stay off the field and you can control the clock. Clearly, you’d like to prevent Justin Smith and Aldon Smith from repeatedly slamming your multi-million dollar quarterback to the turf, while your defense piles up six sacks and nine quarterback hits. All of these things are what every team wants to do to their opponent every week of the season. Did the Giants formulate a blueprint that all other teams can copy going forward? No, they simply executed a plan that most teams knew was there all along but didn’t have much luck executing themselves. Between everyone condemning Alex Smith’s lackluster day and buzzing about Colin Kaepernick possibly taking over as the 49ers starter (which actually might happen at some point), the Giants suddenly jumped back into the conversation of “best team in the NFL.” And it’s pretty easy to see why. When you go to San Francisco and beat the 49ers the way the Giants did, it’s hard not to get excited about a team that has time and again shown that they’re capable of playing with, and beating any team in the NFL. But if I know one thing about the Giants from watching pretty much every game they’ve played in recent memory, it’s that you can’t get too high or low on this team based off one game. As we’ve all seen with the Giants, this team is truly the NFL’s version of Jekyll and Hyde. One week they’re falling behind 14-0 to the Browns at home and looking completely lifeless in the process, and the next week they’re bullying the 49ers on the road and looking like a team that has a serious chance to repeat as Super Bowl champs (so much for getting too high or low on this team based off one game). Their first quarter effort against the Browns just reinforces the idea that you can’t expect the Giants to be consistent for a full game let alone a full season. Playing consistently well for a full season is a tall order for any NFL team, but it’s not uncommon to see the Giants look disinterested and downright terrible for random stretches of a game or even a few games, only to watch them flip the switch and reel off four straight impressive victories in a row. So which team will we see this weekend against the Redskins? I have no idea, but I wouldn’t be surprised if they lost by 20 or won by 20.